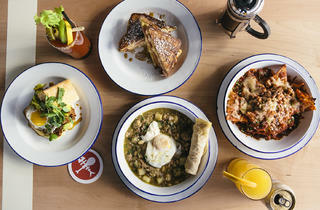 Now that the patio has closed for the season, the tiny fried chicken and fish spot turns its attention to brunch. Photo courtesy Parson's Chicken & Fish.Parson's Chicken &amp; Fish has added a new weekend brunch to its menu. 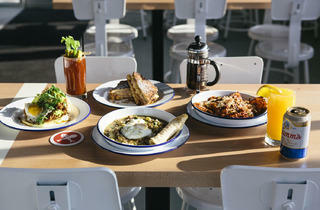 Photo courtesy Parson's Chicken & FishParson's Chicken &amp; Fish has added a new weekend brunch to its menu. Thanks to the Negroni slushy (and the margarita with a Sour Patch rim and the fleeting presence of the dark and stormy slushy), Parson's Chicken & Fish (2952 W Armitage Ave) was one of my favorite summer drinking spots. But once it got cold and the patio closed, it fell out of my regular rotation. 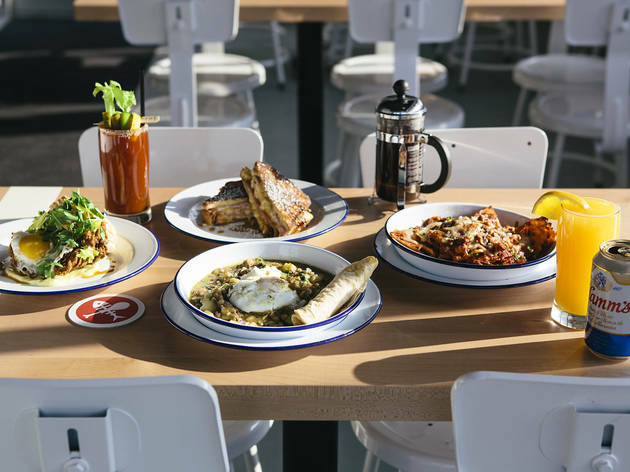 Then at Tasting Table's Open Market event earlier this month, I stopped by the Parson's table and spotted a card announcing its new brunch, which launched December 14 and runs Saturdays and Sundays from 9am–3pm. I visited on a snowy Saturday morning, as far away from summer days spent on the patio as possible. The long summer waits for a table are no more, and you can walk right in and get a seat. It's quiet and calm, and the huge windows are ideal for watching the snow fall. There are two new reasons to keep visiting—first, in late October, it got rid of the communal booths (which I puzzled over in my original review), and replaced them with communal tables and chairs, which means you don't have to sit side-by-side with your dinner date. Second, while the Negroni slushy is still available, the cocktail list has been tweaked for the season to include a lovely winter Negroni made with Hendrick's gin, vermouth and Sorel, a spiced hibiscus liqueur, which makes the cocktail more floral and less bitter. It also includes a spiked cider, which was welcome on the freezing day. The brunch menu is a simple card attached to the regular menu of fried chicken and fish (which is still available during brunch hours). 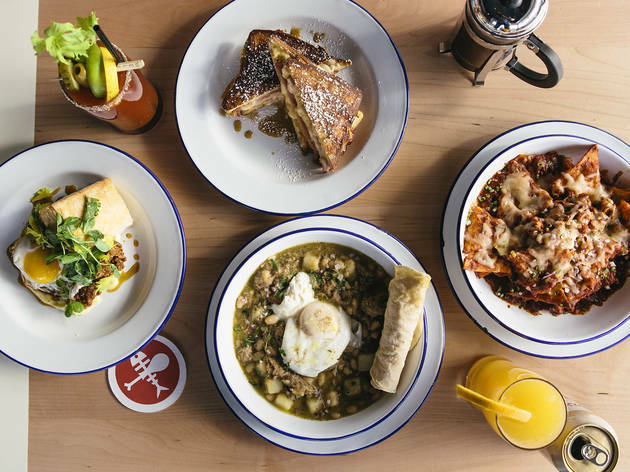 There are only a few options, including a fried chicken biscuit, and we tried the green chile stew, a spicy bowl filled with a poached egg, serrano crème fraiche and warm rolled tortillas to scoop it up. It's warming, but the broth is very thin and I'd love more spice. The very rich monte cristo (a fried French toast sandwich) was stuffed with pork belly and Gruyere and served with bourbon maple syrup. On the side, the hash browns were very thinly shredded potatoes with crisp edges. It's all solidly executed, if not terribly exciting, and the cocktails continue to overshadow the food. But the affordable tab (less than $50 for brunch for two, including cocktails), and the fact that you can get a Negroni slushy without a wait, mean that Parson's is worth keeping in rotation—even in the winter.